On the 14th March, 1933, Michael Caine was born Maurice Joseph Micklewhite in St Olave’s Hospital, Rotherhithe, Bermondsey in South London to parents Ellen Frances Marie (nee Burchell) and Maurice Joseph Micklewhite. Michael’s father worked as a Billingsgate Fish Market porter and his mother was a charwoman. In 1935, his younger brother Stanley was born. Michael grew up in Southwark, South London, but was evacuated to North Runcton in Norfolk during the Second World War. After the war, the family were rehoused by the council in Marshall Gardens at Elephant and Castle, due to much of London’s housing being destroyed during the Blitz. In 1944, Michael won a scholarship to Hackney Downs Grocers’ School and after a year there he moved to Wilson’s Grammar School. He left at 16 and then worked briefly as a filing clerk for Peak Films – his closest step to Hollywood yet. From 1951 Michael completed his National Service and served in the Queens Royal Regiment and the Royal Fusiliers, spending time in Germany and on active duty during the Korean War. As a soldier in Korea, Michael got into a situation where he knew he faced death and the memory of that experience has lasted with him forever and formed his character for the rest of his life. After his time in the Army, Michael went to work at Westminster Repertory in Horsham, Sussex, followed by time at Lowestoft Repertory, where he met his soon-to-be wife Patricia Haines. Once they were married, Michael and Patricia decided to go to London to pursue their acting careers. Unfortunately this proved hard and Michael had to take a lot of soul destroying jobs. On top of this, financial circumstances were dire and Patricia had became pregnant, later to give birth to Michael’s first daughter, Dominique. 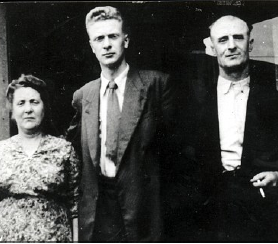 Although this was a happy event for the Caine family, Michael found it hard to cope with lack of job opportunities and finance, and after two and a half years of marriage, Patricia took Dominique back to her parents’ home. This signalled the end of the marriage, which lasted from 1955 -1962. Suffering with a huge amount of guilt, out of work and penniless, Michael returned home to his family. His father was bedridden with rheumatism and unable to work, so Michael was forced to take a job in a steel yard. Unfortunately Michael’s father died and shortly after Michael lost his job in the steel yard. His mother advised him to get away and sort himself out, so upon this advice, Michael chose to go to Paris. During his tenure in the French capital, he survived living in a tiny room in a fleapit hotel and worked in a snack bar. Eventually Michael felt ready to return home. On arriving home he found a telegram from his agent, stating that there was a job for him – a part in a film titled “A Hill in Korea.” Unfortunately the film wasn’t a success and Michael decided to find a new agent. Despite this the work wasn’t pouring in. Michael was then sent to the Theatre Workshop in the East End of London where he played a part in the show of Charles Dickens, titled “The Chimes”. After the Theatre Workshop, Michael visited a casting agency, where he was chosen to play the part of a policeman in a small film. This was the first of many small jobs like these. Four years of minor roles was getting to Michael and he was very close to giving up the business when his agent found him a job on TV in a play called “The Lark.” At this time Michael was known as Michael Scott however his agent informed him that there was already a Michael Scott performing as an actor in London, so he had to come up with a new name. Speaking from a telephone box in Leicester Square, Michael looked around and saw that “The Caine Mutiny” was being shown at the Odeon. He decided to change his name to Michael Caine. Michael has later joked that had a tree been blocking his view, he might have been known as Michael Mutiny! The next few years carried on the same as before, with Michael living hand to mouth, being helped out by friends, with the occasional film or TV bit part. At the end of the 1950s, Michael’s agent, Josephine Burton, passed away. This meant that Michael had to find a new agent. One of the biggest movie companies in Britain at the time was Associated British Pictures, who ran their operations like an old Hollywood studio, with a rota of actors under contract. Michael went to see their Chief Casting Director, where he was told to give up acting. This just made him even more determined to succeed. On Michael’s return to London he was arrested for the non-payment of maintenance to Patricia and Dominique Micklewhite and was ordered by the court to pay 3 pounds and 10 shillings per week, which was all Michael had on him at the time, or go to jail. months. 1960 came with a rocky start but financially it was Michael’s best year so far. He played a small part in a BBC Book Programme in which they dramatised the book under discussion. This wasn’t an earth shattering job but it meant that Michael met the director John McGrath, who became a good friend. Michael also met the playwright Harold Pinter, who wrote the play “The Room’, in which Michael appeared in. As Michael got to know John McGrath even better, this led to him starring in McGrath’s TV play called “The Compartment”. This play proved to be a success in many ways for Michael as it proved to many people that he could remember 45 minutes of dialogue. But the most satisfying and beneficial sign that the play, and Michael, were a success, came a little while after it was broadcast – Roger Moore, who was already famous for the series “Ivanhoe”, walked up to Michael and told him that he was going to be a big star. Thanks to the success of “The Compartment”, Michael had five major parts on TV that year and also starred in a play by Troy Kennedy Martin, who would later go on to write the film “The Italian Job”. After seeing “The Compartment”, Dennis Selinger, one of the biggest agents in England, had taken on Michael as a client. He sent Michael a play from a producer called Michael Codron – “Next Time I’ll Sing to You” by James Saunders. The play was a big hit with the critics and ended up moving from the Arts Theatre to the Criterion Theatre in Piccadilly. At long last, Michael was in the West End. One night, at the end of a performance of “Next Time I’ll Sing to You”, Stanley Baker, one of the biggest stars in British cinema, came backstage to speak to Michael. He told him about a part in the film “Zulu”. It was 1963. Michael had replaced London for the Drakensberg Mountains in northern South Africa for the filming of “Zulu.” It took three months to film and Michael was very homesick – once the plane took off back home from Johannesburg airport, there was a loud cheer. Michael returned to London with most of his £4000 free intact, as accommodation and meals had been free during filming and there was nowhere else to spend money. Michael immediately went to see Dominique, who was now eight years old, and crazy for horses. So Michael bought her one. Michael’s mother was his next concern. He was not happy with her living in a prefab in such a rough area so he moved her into a flat in Brixton. This was ideal as the building was actually a big house divided into flats and some of the other people living there were of similar age to Michael’s mother. She now felt safe and secure and had company. Michael saw the happiness that he could bring to his mother from his success and it was a source of tremendous joy. "1960 came with a rocky start"
In order to get the part in “Zulu” Michael had to sign a seven year contract with Embassy Pictures. This was to protect their investment in Michael; however the option was on their side only. Unfortunately the day came when Michael received a call to say that Embassy Pictures would not be taking up his option. The reviews for “Zulu” were positive and from this Michael got to play the lead part of spy Harry Palmer in one of his most recognised films, “The Ipcress File”. Michael also received a seven year contract and now, aged 32, life was really changing. Suddenly he was able to indulge himself in all the material tings that had been missing so far. After the director Lewis Gilbert saw a rough cut of “The Ipcress File”, Michael was offered the title role of “Alfie.” The reviews of “Alfie” were great and it established Michael as a genuine star. Suddenly Michael ended up in New York to publicise “Alfie” and “The Ipcress File” and his impossible dream had come true. The latter had proven to be a such a success, Michael was offered more roles as Harry Palmer in the films based on Len Deighton’s novels. Finally it was back to London for a short respite before returning to Majorca to make “The Magus”, which, along with “Deadfall”, was the second of Michael’s two picture deal with Twentieth Century Fox, but was a critical disaster. Michael Caine himself has said that it was one of the worst films he had been involved in. After three years of travelling and starring in films, Michael was finally home in London again and it wax his priority to find a new flat. He found a beautiful home in Grosvenor Square which had three bedrooms, two large houses, a big hall, an office, a vast kitchen in which you could dine, plus a dining room which Michael immediately turned into a little cinema with a 16mm projector. The flat was filled with state-of-the-art stereo and TV equipment and brand new furniture. He gave his old flat to his brother Stanley, with everything in it. Stanley was not working in the book department of Selfridges where he was very happy. Michael, now comfortably ensconced in his new abode, looked as his life to see if there was anything missing. After great consideration he came to the consideration that now, at the age of 35, it was time to acquire a car. He couldn’t drive. But he had enough money for a chauffeur. Michael’s next film, and possibly most famous, “The Italian Job”, started shooting in London, directed by a young newcomer called Peter Collinson. This was followed by an all-star cast blockbuster movie, “The Battle of Britain”. Michael went on to film “Too Late the Hero”, a World War II story of a battle between a small unit of British soldiers and one American, against the Japanese. Now that it was 1970 and Michael was starring in more films, he decided he wanted his mother to have her own house. She was still living in the block of flats in Brixton along with other relatives. Michael then bought a big house in Streatham in South London and split it into flats so everyone could move there. The next plan for Michael was for him to become a Producer and he went into partnership with a friend called Michael Klinger, who was a Producer by profession. Michael had the rights to a book called “Jack’s Return Home”, which together they filmed under the title of “Get Carter.” Unfortunately when the film came out it was slammed by most critics for the violence – it was just too realistic. The next film Michael made was the only one for which he was never paid. It was called “Kidnapped” and was based on the novel by Robert Louis Stevenson. Filming took place on location in Scotland, but after three hard months of filming, Michael knew that this film was going to be a dud. He was now drinking heavily and smoking about 80 cigarettes a day, so consequently was not in the best of spirits. He decided to take himself off to the countryside to attempt rehabilitation. kidnapped One evening Michael was at a party when he felt someone reach into his pocket, remove his cigarettes and throw them in the fire. This person turned out to be Tony Curtis. He said “I’ve been watching you, that’s the third cigarette you have lit since you entered the room and you have only been here 20 minutes.” Tony then proceeded to give Michael a lecture on the dangers of smoking and he did this with such skills that Michael gave up there and then. It was about time for Michael to look for a new home and he found a beautiful 200 year old water mill in a little village just outside Windsor, called Clewer. It had a 100 yards of frontage to the Thames, a small stream running through the middle of it and the actual house stood right on the main side-stream and millrace with the millwheel in it. It wasn’t in a good state and the garden was derelict, but this was exactly what Michael was looking for. He decided that garden would be his therapy. It was perfect. Michael later received a phone call from Dennis saying that he was sending a script for a film for him to star in with Elizabeth Taylor. It was called “Zee and Co” and was written by Edna O’ Brien. One night in 1971, Michael and his friend Paul were watching TV when an advert for Maxwell House coffee came on. On screen was the most beautiful girl Michael had ever seen. The effect she was having on Michael was extraordinary. Michael’s friend Paul asked him what was wrong and Michael replied, “that girl, she’s beautiful. I want to meet her”. The following evening, at a club, Michael bumped into Nigel Politzer, who worked for the company that made the commercial. Nigel told Michael that the girl’s name was Shakira Baksh and that she lived somewhere in Fulham Road. He agreed to phone Shakira for Michael the following morning. One restless night later and Michael awoke to a phone call from Nigel, informing him that Shakira had agreed to a call from him. Michael decided that he would take the bull by the horns and called her asking her out for dinner. Shakira said that she was busy for the nbext week and asked Michael to ring her in ten days’ time. For ten days Michael was in a trance. Eventually he rang her again and she agreed to go for a meal but she would pick him up. Shakira arrived at 8 o ‘clock and Michael could not believe how beautiful she was. As he took her hand he could feel vibrations through his hands and he though of something the French say about love: L’amour, c’est une question de peau (love is a question of skin). Michael suddenly realised that he had not even spoken yet so he asked Shakira to come in, but no sound came out. He cleared his throat and had another go. Shakira came into Michael’s flat and into this life forever. After that evening Michael saw Shakira constantly, until she had to go off and do a modelling job in Mexico and Michael had to go to Malta to make a movie called “Pulp”. Michael and Shakira talked as often as they could by phone and the moment Shakira finished working, she joined Michael in Malta. They’ve remained together ever since. Back in England, Michael invited Shakira to move into his flat and they settled down to a sort of married life. Very soon the lease was up on the flat and they decided to live in Windsor full time without a London base. It was at this time that Shakira pointed out to Michael that he was drinking two or more bottles of vodka a day. This came as a complete surprise to Michael and was such a shock that he gave up drinking altogether for a year. Life was suddenly completely different and absolutely perfect. To top it off, Michael received an invitation to star opposite Lawrence Oliver in the film version of the Anthony Shaffer play “Sleuth”. In January 1973, Michael and Shakira decided to get married in Las Vegas. They decided that they didn’t want a big fuss and these chose the romantically named “Little Chapel on the Green”. "that girl, she's beautiful. I want to meet her"
Later that year, in July, Shakira gave birth to a baby girl of 6lb and 12 oz, whom they called Natasha. Michael’s next movie in England was called “The Romantic English Women” and was his first foray into the realms of artistic films. The film was not only very convoluted, but in Michael’s own words, ‘it was downright grim’. Michael decided to do it though because the director Joe Losey had a tremendous reputation for being artistic. “The Romantic English woman” not only flopped financially but the critics didn’t like it either. the-romantic-english-women Michael and Shakira spent mini honeymoons in Paris, usually over a long weekend every three or four months. During one of these trips Michael received a phone call from John Huston, causing him to nearly drop the phone. John Huston was the one director whom Michael actually idolised so was surprised when he was invited to come and meet him at his hotel – he wanted Michael to be in his film of a short story by Rudyard Kipling – “The Man Who would be King”. The night before they started shooting the film, Michael and John were having dinner when John dropped the bombshell that the girl who was to play the part o the beautiful Indian princess was no longer available. Shakira was sitting at the table and suddenly said firmly: “I am not going to play the part.” Of course, over the following days John persuaded her to take the part. Michael is very proud of his role in “The Man Who Would be King” and feels that it is one of the finest films that he has been in. It’s now 1976 and Michael’s next movie was in England on location in a place called Muapledurham. The film was called “The Eagle Has Landed” and was the story of a band of German commandos who were sent to England during the war to assassinate Winston Churchill. One of Michael’s dreams had been to open a restaurant and one day he was introduced to Peter Langan, who already owned a restaurant. He told Michael to come and see him when he was ready. When Peter next saw Michael he told him that he had taken on a lease of a very well known restaurant called Coq D’or. Peter offered Michael a third share of the action for £25,000. Michael accepted. On a quiet Monday night, Langan’s Brasserie opened to just a few friends and passers-by, but it didn’t take long for it to become the place to be seen. On a very different Monday, Michael’s account asked to see him as a matter of urgency. It turned out that Michael and Shakira would either have to cut their standard of living or leave England, as Michael was paying so much tax he was being left penniless. Michael and Shakira decided to move to Los Angeles, the only trouble was the houses were very expensive. Michael immediately accepted a role in the film “The Silver Bears”, followed by a film called “The Swarm” and earned £250,000 to put towards his house in America. On the 3rd January, 1979, Michael and Shakira flew to Lose Angeles after selling the Mill House to Jimmy Page of the rock group Led Zeppelin, for three quarters of a million pounds. Michael and Shakira settled into their new home quickly and soon were receiving invites from many people. Michael’s work situation, however, was not quite so rosy. Before they left England Michael had done a short stint on a brilliant movie called “California Suite” by Neil Simon. For the first time Michael was playing a homosexual and Michael got good reviews for his portrayal, as did the film. Once Michael was in Hollywood, he was rescued by his old friend Irwin Allen, who invited him to star in “Beyond the Poseidon Adventure,” a sequel to his successful “The Poseidon Adventure”. "either have to cut their standard of living or leave England"
Professionally, Michael’s luck was still running cold and unfortunately he ended up with four clunkers in a row. He needed a miracle and this came in the shape of a film entitled “Dressed to Kill” – he played a transvestite psychiatrist murderer. Although Michael was enjoying his life in Los Angeles, he knew deep down that his heart was still in England. He could now legally spend 90 days per year in England and he tried to use them up every year. Michael found that he had become a sort of British Social Ambassador whenever royalty or the aristocracy came to visit America. On one occasion that Michael was in attendance, he found his mind wondering, when he heard a familiar voice – the Queen. She asked Michael if he knew any jokes, to which he replied “yes, but very few that I could tell you.” She prompted him to “have a go” and she’d tell him one. For the rest of the evening they swapped jokes. 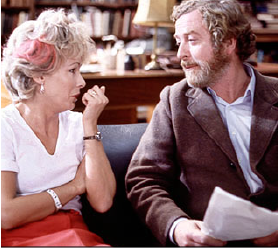 “She asked Michael if he knew any jokes” Whilst he was offered a role in “Norma Ray”, he turned it down in favour of “Educating Rita”, a film about a working class girl who tries to better herself with education and her relationship with the professor who becomes her mentor. Michael played the role of Dr. Frank Bryant and won a BAFTA Award for Best Actor in a Leading Role, as well as an Oscar nomination. This was followed by a not-so-successful film, “The Honorary Consul” which saw Michael travel to Mexico to shoot the film. He hated leaving without his family but Natasha was happy at Marymount School in Westwood and Shakira was content with her life in Hollywood. The picture was not well received and to top it off, the title was changed to “Beyond the Limit”, detracting away from the fact he played the Consul in the film. Michael and Shakira had been in Hollywood for five years and made some tremendous friends whilst enjoying a happy, comfortable life. However, Michael had been unhappy for some time and Shakira had noticed this. They made a deal that if his performance in “Educating Rita” didn’t get an Oscar, they wouldn’t stay in America. Robert Duvall went on to win the Oscar for best actor (though Michael did win a BAFTA), so it was time for Michael to go home. Before looking for a new home in England, Michael worked on his next project, “Blame it on Rio”, a risqué comedy about a man who is seduced by his best friend’s young daughter. In the summer of 1984 Michael and Shakira decided to look for a new home in England. After a long search they eventually found an ideal property in Oxfordshire and agreed to rent it for the summer and then buy it. The project was in a mess and would need a lot of renovation to make it as Michael and Shakira wanted. "She asked Michael if he knew any jokes"
In November 1984, Michael went to New York to film “Hannah and Her Sisters”. In June 1985, Michael’s friend Marty Bregman invited him to play a small, but smashing part, in his new film “Sweet Liberty”. The following February Michael went back to England to film Freddie Forsyth’s novel “The Fourth Protocol”. More travelling ensued as Michael worked on a small budged movie called “The Whistle Blower” in the south of France, before heading back to Los Angeles with Shakira to do more packing. Michael was offered a small part in the fourth of the “Jaws” series of films. The film was a commercial flop but Michael has famously said “I have never seen the film, but by all accounts it was terrible. However, I have seen the house that it built, and it was terrific.” Despite the film being abysmal, whilst he was filming in Nassau, he was informed that he had won the Academy Award for Best Supporting Actor for the film “Hannah and her Sisters”. The house in Oxfordshire was finally finished in the summer of 1987 and was ready for the Caine family to move into. In 1988 a writer-director called David Wicked sent Michael a script based on a new and intriguing theory of the true identity of Jack the Ripper. He wanted Michael to play the real life detective who investigated the Ripper case. This became a miniseries and was a massive success all over the world. Michael then starred in a comedy movie called “Dirty Rotten Scoundrels”, followed by a small budget thriller called “Shock to the System”. One Michael’s return to England, he plunged straight into his second miniseries for TV, “The Strange Case of Dr Jekyll and Mr Hyde”. Michael’s next role was in the movie version of “Noises Off” which was to be made at Universal Studios in Los Angeles. This gave Michael and Shakira a chance to find a home to buy there. In 1992 Michael produced “Blue Ice” and opened a new restaurant “The Canteen” in Chelsea Harbour. He then played Scrooge in the Muppets movie version of the Charles Dickens classic “A Christmas Carol”. He also wrote his first autobiography “What’s it all About?”. In the 1992 Queen’s Birthday Honours, Michael was appointed Commander of the Order of the British Empire (CBE). However, the 90s weren’t great for Michael as his career began to falter with a series of below-par films. These included Steven Seagal’s environmental action film “On Deadly Ground” in 1994 and “Bloody and Wine”, a 1996 thriller which co-starred Jack Nicholson and Judy Davis. He also starred in two straight-to-video Harry Palmer sequels as well as a few television films. 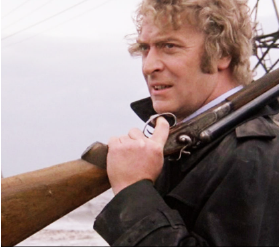 Towards the end of the decade, Michael Caine’s career began to rebound. He was becoming well recognised through his TV work, such as his stint in he 1997 miniseries “Mandela and de Klerk”. He also kept himself busy through his restaurant work and enjoyed a new wave of appreciation from younger filmmakers who praised him as the film industry’s enduring model of British cool – his films “Get Carter” and “The Italian Job” had immortalised him as the definitive figure of cool. Michael starred in the acclaimed film “Little Voice” in 1998. He won a Golden Globe for his portrayal of a seedy talent agent. Returning to form, Michael got better roles, such as his role of an abortionist in “The Cider House Rules”, for which he won his second Academy Award for Best Supporting Actor. "he won his second Academy Award"
In the 2000 New Year Honours, Michael was knighted as Sir Maurice Micklewhite CBE in recognition of his contribution to cinema. The same year he also received a BAFTA Academy Fellowship Award. The start of the new millennium saw Michael go from strength to strength. His career had been revitalised and he had a newfound popularity with younger fans who were appreciating his earlier efforts. He scored a hit with the art-house film “Quills” as his turn as Dr Royer-Collard. He also appeared in “Miss Congeniality” and in 2001 starred in “Last Orders”. The following year he showed that he still had it as he played a star turn in “The Quiet American”, which saw him Oscar nominated for Best Actor. He also played the humorous role of Nigel Powers, the father of Mike Myer’s protagonist in “Austin Power in Goldmember”. "showed that he still had it"
Several of Michael’s popular films were remade during this decade, such as “The Italian Job”, “Get Carter”, “Alfie” and “Sleuth”. 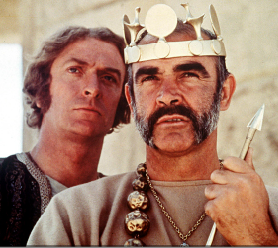 In the latter, he took the role that Laurence Olivier played in the 1972 version and Jude Law played Michael’s original role. 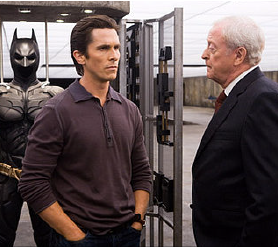 In 2003 Michael co-starred with Robert Duvall in “Secondhand Lions” and in 2004 he played the family elder, Henry Lair, in “Around the Bend.” 2005 saw Michael play a pivotal part in the rebooted Batman franchise when he was cast as Bruce Wayne’s butler Alfred Pennyworth in “Batman Begins”. When Michael was asked by director Christopher Nolan to play the part of Alfred, he was skeptical at first. But after reading the script, he realised that this Alfred is a surrogate father, mentor and emotional backbone for Bruce Wayne. Michael approached the role with the same level of dedication as he did his Oscar-winning turns in “The Cider House Rules” and “Hannah and her Sister.” He even invented a clever backstory for Alfred, imagining him as a former SAS officer who was wounded in the war – he can’t go back into combat so he takes over dining duties for the sergeants – one of whom is Bruce’s father. This portrayal of Alfred certainly lived up to the hype and was an integral part of The Dark Knight trilogy. In 2006, Michael joined the cast of sci-fi drama “Children of Men” and also teamed up again with Christopher Nolan to play a supporting role in “The Prestige”. Michael cut a poignant figure in 2008’s “Is Anybody There” in which he played a retired magician crumbling into the final stages of his life. As a result, Shakira found the film so unsettling that she banned their pregnant daughter, Natasha, from seeing it. One of the most harrowing scenes of the film depicts the onset of the character’s dementia. Michael has revealed that he based this on the death of his best friend, Dough Hayward, who suffered the same fate. That year he also took up the mantle of Alfred Pennyworth in the hit Batman sequel “The Dark Knight”. 2009 saw Michael take the lead role in “Harry Brown”, which saw him return to his native South London estate in the titular role. Michael reunited with Christopher Nolan for the mind-bending “Inception” as Professor Stephen Miles, the father-in-law and mentor of Leonardo DiCaprio’s character. He also leant his voice to animated films in 2011 as he voiced Lord Redbrick in “Gnomeo & Juliet” and Finn McMissile in “Cars 2”. The next year he reprised his role of Alfred again for the last Batman sequel “The Dark Knight Rises”. He filmed his scenes for the film at Wollaton Hall in Nottinghamshire. Michael is again reuniting with Christopher Nolan in 2014’s sci-fi film “Interstellar” and is also cast in Matthew Vaughn’s upcoming film “Kingsman: The Secret Service”. and hosted by OneCom . All images are copyright to their respective owners.